A friend was telling me about this really cool exhibit of swimmer quilts. We had time to walk over to the building yesterday so I thought I would share with you too. My girls swam from the age of 5 through high school. The middle one even swam for a Big 10 school in college. Swimming was a huge part of our lives. 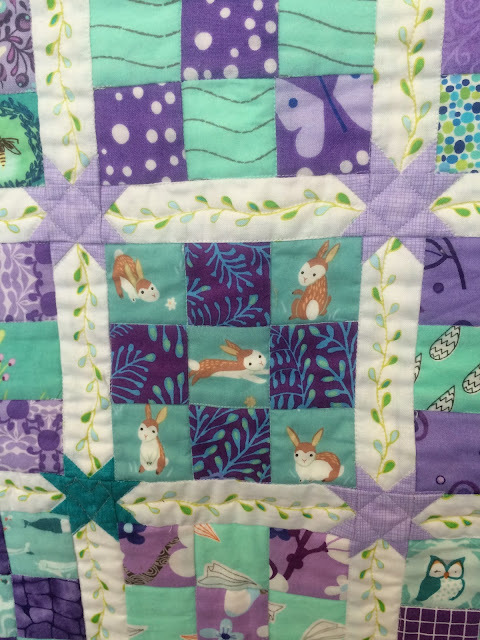 These quilts were made by Bonnie J Smith. Here is one of the signs that went with this first quilt. I didn't take photos of them all though. This one reminded me of the practice lanes. I hope you enjoyed this exhibit as much as I did! I have been working on a baby quilt for a friend's daughter. and is now expecting her first baby in June. The nursery colors are lavender and pale yellow. I had the Feathers pattern and knew that is what I wanted to make. I did not know the birds are gigantic, LOL. I decided that I wanted to sash them using stars so I did the math and got those done. Then I wanted to put prairie points around the border and then another white border. I used 5" squares for the prairie points. (it had birds on it) so I found a cute sort of pebble looking one that I decided could be bird seed! Perfect. My friend Robin, and I were struggling to get it open when our friend, Judith took this gem, LOL. You will hear more about Robin very soon. She made an amazing quilt for her grand daughter. Then she made 2 doll quilts to match. You will NOT believe the fabrics she cut up! They could NOT be any cuter, so stay tuned!! This is how the top came out. I could not love it more! It is kind of difficult to see but the yellow prairie point in the middle of each section fits exactly into the open space in each yellow star. I decided that I wanted to use a star with a mixed purple background to make the label. 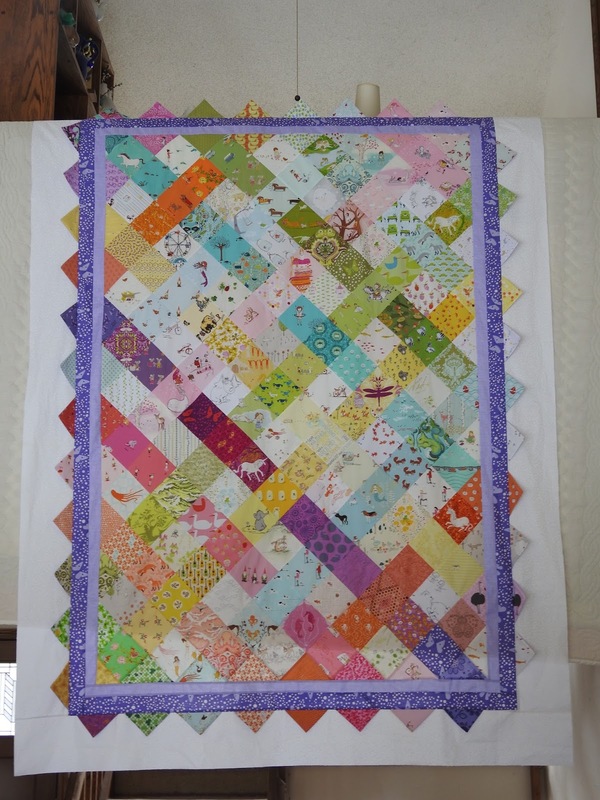 I also wanted to have it quilted right in, so pieced into the back. Anyone else dislike making pieced backs? I love the look, but it took almost as much time as the front! I will have to put in the date once the baby is born though. Just in case you are wondering. This label is written. I usually embroider them but had the opportunity to get it in the quilting que so written it is. I type it out on the computer, and use a light box to transfer the words to my label. 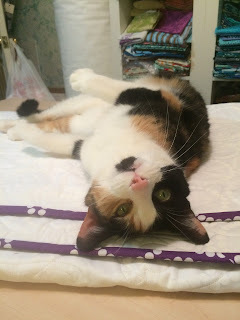 I use a Frixion pen if I am going to embroider. In this case I used a permanent pen to do the writing and heat set it. Transferring this way ensures that I don't misspell or make a mistake. Bonus is that the writing is neat! Plus you can choose the font. 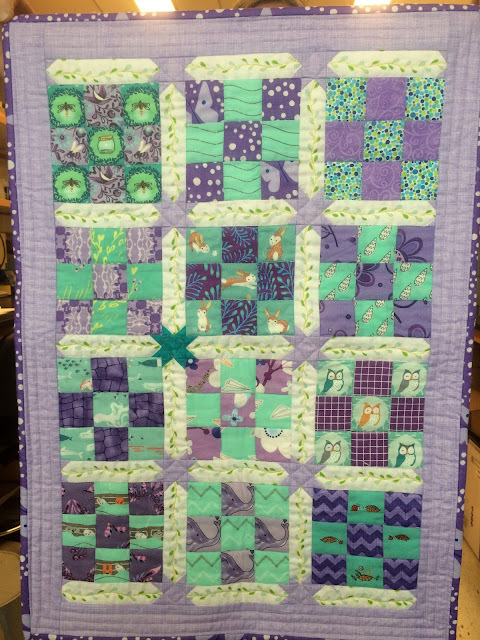 I wanted to use the purple circles for the entire back but did not have enough, hence the pieced back. I used left over squares, cut for the prairie points for the strip of squares. Then used up all the yellow vine I had to make the top and bottom. I proudly got out the top and guess what? It was not wide enough, SOB!!! So I had enough of all the fabrics to add a 4" strip on each side. Darn it, more quilt math, and late at night. I needed to have it done to turn over to my quilter tonight. Both long enough and wide enough now. I think the quilt should finish around 64" square, I didn't actually even measure it even now. Well, these are the things we quilters do, right? Make mistakes and fix them the best we can. I'm in love with my little flock of birdies though. 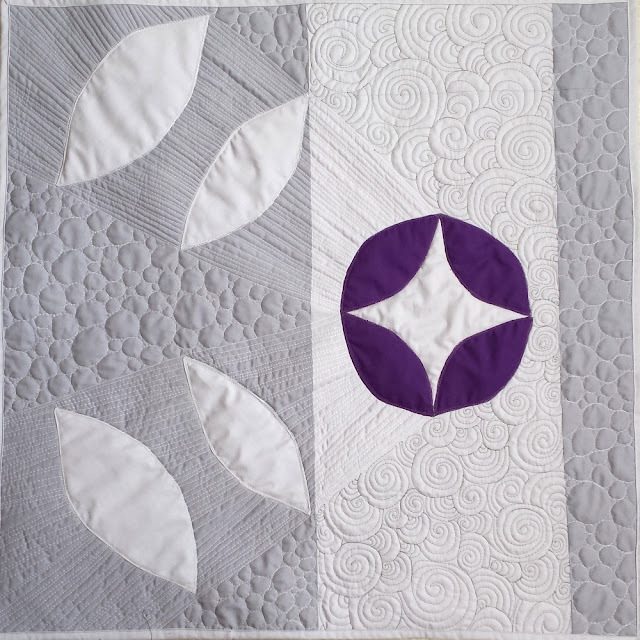 *Disclaimer: This post is in no way meant to discredit longarm quilters. You are amazing and talented professionals! However, lots of people are intimidated to try quilting on their own, and one of my goals is to inspire more people to feel confident about domestic machine quilting. 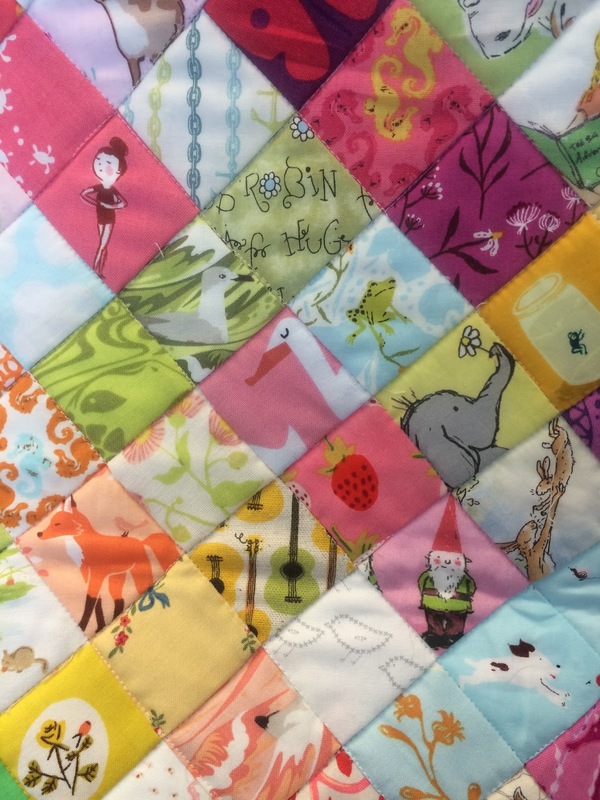 Six years ago, I remember going to Google.com and typing in "definition of quilting." 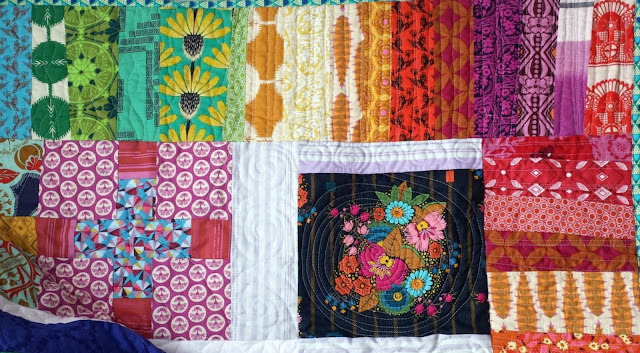 I knew how to sew already (from a class in high school), but I didn't know that the quilting is what holds the three layers of a quilt together. 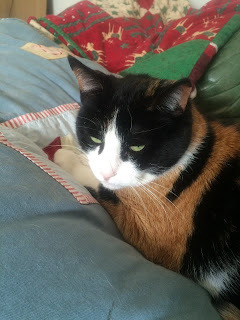 Armed with just the internet, I forged ahead to quilt my first quilts. Until I joined a guild a few months later, I had no idea that many quilters outsource their quilting to longarm quilters! The sun highlights the quilting on my Mountain Sunset quilt - a sample for my Landscape Quilt workshop. I kept quilting myself, mainly because I LOVED it, and as I practiced on my tiny Brother machine from Walmart, I realized that this was something I could really invest in. 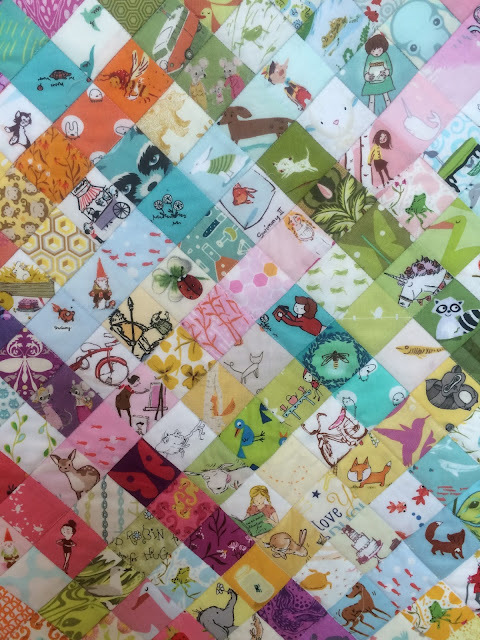 No, not buying a longarm or midarm myself (at least not for a long time still - that isn't in the budget), but enjoying the simultaneous peace and challenge that is domestic machine quilting. 2. The sense of accomplishment. You made that ENTIRE QUILT yourself. Amazing work, you! 3. It's cheaper. 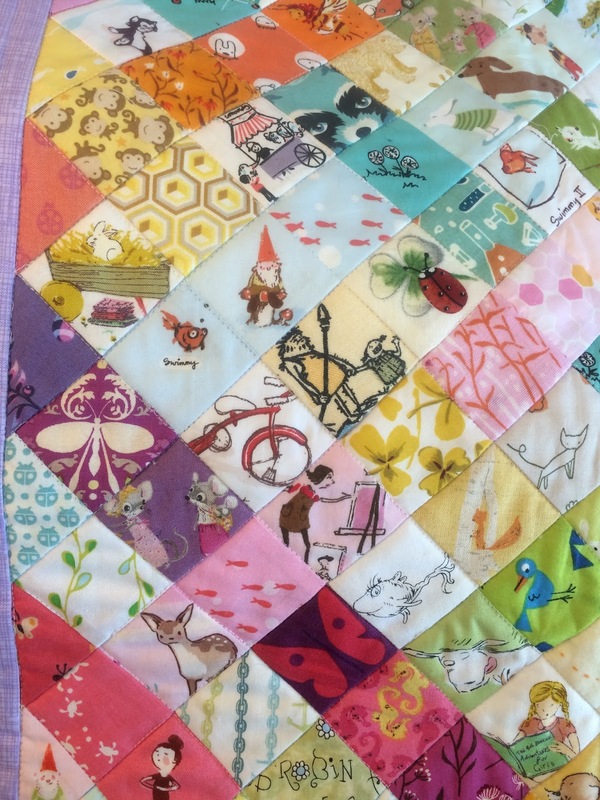 Yes, it can take a long time, and you might have to invest in some tools (though you really don't HAVE to - you can easily quilt on a small, basic machine! ), but you're doing all the work yourself. Some will say that time is money, but even so, you're not shelling out hundreds of dollars off the bat to get a quilt quilted. For someone who would rather spend craft money on fabric (me), this is an important point. 4. It's imperfect. I know lots of people strive to have "perfect" quilting, but I'm not one of them. I *like* having little flaws here and there. They remind me of my journey and encourage me to keep working hard. One of my current main focus areas is keeping a consistent-as-possible stitch length, which is not impossible but difficult on a domestic machine (especially with large quilts). Embracing imperfection is important when it comes to sewing - because no one is perfect. A new piece I haven't shared fully yet, but I will soon over on my blog. 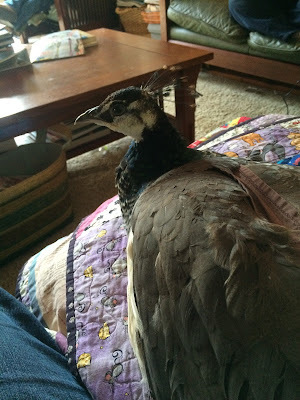 I try to share as much detail as possible about my quilting process over there. 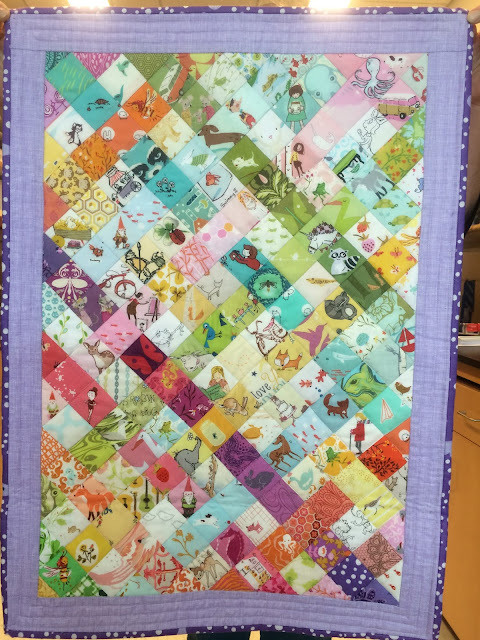 My favorite free motion quilters are Angela Walters and Christina Cameli. They both teach in an accessible, detailed, and friendly way. Do you free motion quilt or use a walking foot to quilt on your domestic machine? If not, what's holding you back from trying? Feel free to share in the comments!